Here are some snazzy birthday facts about 17th of July 1975 that no one tells you about. Don’t wait a minute longer and jump in using the content links below. Average read time of 11 minutes. Enjoy! What day was my birthday Jul 17, 1975? July 17, 1975 was a Thursday and it was the 198th day of the year 1975. It was the 29th Thursday of that year. The next time you can reuse your old 1975 calendar will be in 2025. Both calendars will be exactly the same! This is assuming you are not interested in the dates for Easter and other irregular holidays that are based on a lunisolar calendar. What day is July 17 this year? There are 86 days left before your next birthday. You will be 44 years old when that day comes. There have been 15,985 days from the day you were born up to today. If you’ve been sleeping 8 hours daily since birth, then you have slept a total of 5,328 days or 14.59 years. You spent 33% of your life sleeping. Since night and day always follow each other, there were precisely 542 full moons after you were born up to this day. How many of them did you see? The next full moon that you can see will be on May 18 at 21:13:00 GMT – Saturday. Fun stat: Your first one billion seconds (1,000,000,000) happened sometime on March 25, 2007. If a dog named AJ - a Yorkipoo breed, was born on the same date as you then it will be 192 dog years old today. A dog’s first human year is equal to 15 dog years. Dogs age differently depending on breed and size. When you reach the age of 6 AJ will be 40 dog years old. From that point forward a small-sized dog like AJ will age 4 dog years for every human year. View the complete list of July 17 celebrity birthdays. Who are the famous July 17 birthdays? Here’s a short list of famous people in history who were born on Jul 17. View the complete list of July 17 famous birthdays. What happened on my birthday – Jul 17th? Bhagavan Sri Ramana Maharshi, the Indian sage, at age 16, spontaneously initiates a process of self-enquiry that culminates within a few minutes in his own permanent awakening. The RMS Carpathia, the ship that rescued the 705 survivors from the RMS Titanic, is sunk off Ireland by the German SMU U-55; five lives are lost. World War II: The main three leaders of the Allied nations, Winston Churchill, Harry S. Truman and Joseph Stalin, meet in the German city of Potsdam to decide the future of a defeated Germany. A revolution occurs in Iraq when Abdul Rahman Arif is overthrown and the Ba'ath Party is installed as the governing power in Iraq with Ahmed Hassan al-Bakr as the new Iraqi President. The opening of the Summer Olympics in Montreal is marred by 25 African teams boycotting the New Zealand team. Nicaraguan dictator General Anastasio Somoza Debayle resigns and flees to Miami, Florida. Two suicide bombers detonate themselves at two separate hotels in Jakarta, Indonesia. A French regional train on the Pau-Bayonne line crashes into a high-speed train near the town of Denguin, resulting in at least 25 injuries. View the complete list of July 17 historical events. What does my birthday July 17, 1975 mean? Your birthday numbers 7, 17, and 1975 reveal that your Life Path number is 1. It represents initiative, potential and singularity. You are a born leader. You insist on your right to make up your own mind; you demand freedom of thought and action. The following celebrities also have the same life path number: Ray Gravell, Jerry Keller, Cynthia Stevenson, James Redfield, Jason Spevack, Rob Dyrdek, Lasse Hallström, Analeigh Tipton, Charlie Schlatter, Jeanette MacDonald. 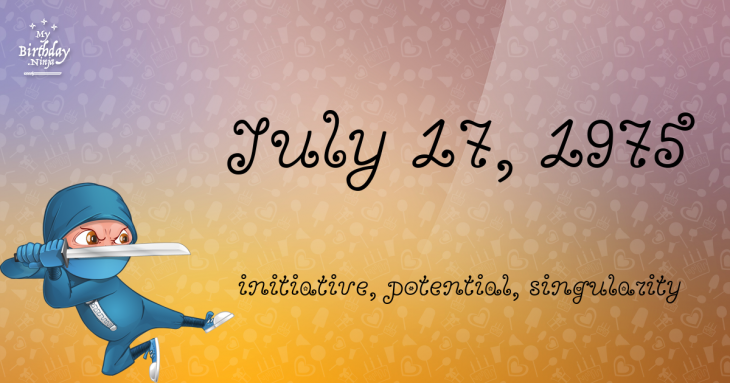 What is the birthday horoscope for Jul 17, 1975? The Western zodiac or sun sign of a person born on July 17 is Cancer ♋ (The Crab) – a cardinal sign with Water as Western element. The ruling planet is Moon – the celestial body of moods and emotions. According to the ancient art of Chinese astrology (or Eastern zodiac), Rabbit is the mythical animal and Wood is the Eastern element of a person born on July 17, 1975. What is the birthstone for July 17? Fun fact: The birth flower for 17th July 1975 is Larkspur for haughtiness. What is the Love Match for Jul 17, 1975? When it comes to love and relationship, you are most compatible with a person born on November 18, 1966. You have a Love Match compatibility score of +139. Imagine being in love with your soul mate. On the negative side, you are most incompatible with a person born on January 15, 1994. Your incompatibility score is -204. You’ll be like a cat and a dog on a love-hate relationship. Arf-arf, I want to bite you. Meow-meow, stay away from me! What is a good birthday trivia for July 17? The number-one hit song in the U.S. at the day of your birth was Listen to What the Man Said by Wings as compiled by Billboard Hot 100 (July 19, 1975). Ask your parents if they know this popular song. I do not know how you feel about this, but you were a male ♂ in your last earthly incarnation. You were born somewhere around the territory of USA South-East approximately on 1600. Your profession was jeweler, watch-maker. How many babies were born on July 17, 1975? Base on the data published by the United Nations Population Division, an estimated 121,558,022 babies were born throughout the world in the year 1975. The estimated number of babies born on 17th July 1975 is 333,036. That’s equivalent to 231 babies every minute. Try to imagine if all of them are crying at the same time. What is the popular baby name on 17 Jul 1975? What’s your bizarre Florida Man story? The #FloridaManChallenge is breaking the Internet and social media. Some crazy men, women, or creatures from the Sunshine State are making headlines every day of the year including your birthday. Try this fun exercise. Pick your search engine of choice and type in “florida man July 17” and see what kind of wild news headline you will get. This viral craze started in 2013 and gets resurrected now and then. The latest was from Tumblr and found its way to Twitter. As they say, the rest is history. Here’s a quick list of all the fun birthday facts about July 17, 1975. Celebrities, famous birthdays, historical events, and past life were excluded. 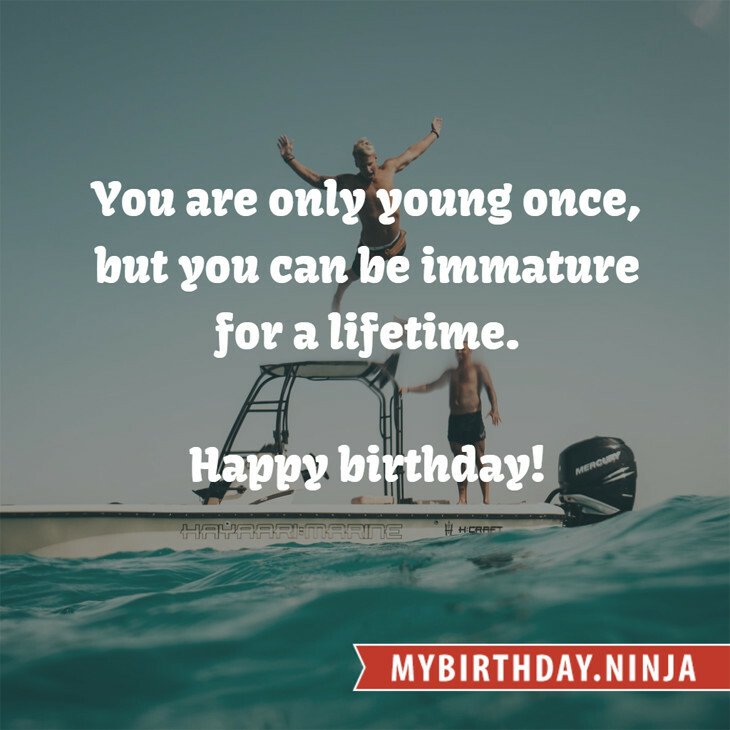 Try another birth date of someone you know or try the birthday of these celebrities: February 16, 1934 – Herbie Kalin, American singer (Kalin Twins) (d. 2006); October 20, 1927 – Joyce Brothers, American psychologist, author, and actress (d. 2013); July 20, 1973 – Omar Epps, American actor, rapper, and producer.